. : Dream Castle Room Contest :. Take a picture of you and your room with a castle you made and share it with us!!!! Date of Announcement: We will announce the 10 selected nominees on 09/08 (Thurs). 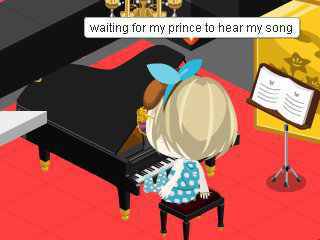 Photos of 10 selected nominees will be posted on Ameba Pico World facebook fan page Photo Album. All the users can chose one of the best photos they like by clicking “LIKE” buttons! visit the link below and simply click “Like” button while you are logged in to facebook. Take a photo with Pico camera, save it to your facebook album or your PC. 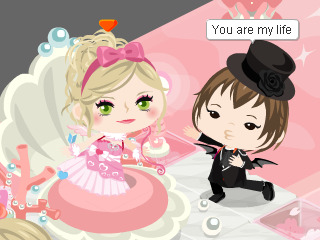 Post a picture to the Ameba Pico fan page wall with your Pico name! If you have a blog, take a photo with Pico camera and save it to your PC. Post the photo to your blog or homepage with a comment about your Pico life, how you are enjoying Pico. Comment on this blog with a link of your blog page, the page you posted your Pico photo. *be sure Thomas or Chloe can post a comment. Must be original; make sure it is YOU in the photo. Abide by Ameba Pico’s Terms of Service. Must be appropriate for all ages to view. So Join now and don't miss the chance! 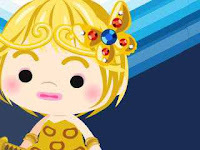 and get a chance to win AMEBA GOLD!!! Everyone can build their own castle now! Check out the latest I and the last items and park for this month! Check out the New Park, Castle of your Dreams! Check out the NEW Park! And Get the cool Items! Pico Rock Band's this month's Live was held in my room (MaiRie Étoile) and all rooms were full. 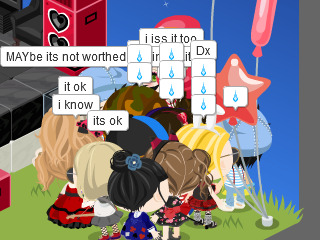 About morethan 100+ picos wasn't able to see their live and I would like to apologize about it. The concert didn't went well but some who were able to watch their performance enjoyed it. First, becase there were too many people and my dad, White! Étoile can't enter my room 4 and so, I don't have any choice but to kick the people inside it, tho they don't want to leave. Second, we all know that the 16x16 room's limit is only 20 picos can enter. I hope that, everyone understands what ever happens today, specially in my room 4, in the venue. Everyone who were there saw how it was before the concert started. how troublesome to manage the rooms and the people entering it. I hope that everyone knows that PRB members are just normal picos like everyone and cant enter a full room w/o waiting.and me, who can't give a special entering for the performers to enter w/o waithing. 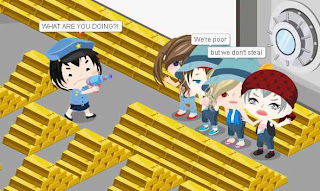 Cuz even us, Étoiles, MiaRi Étoile, YaSuo Étoile, Bry Étoile, Yellow! Étoile and others wanted to watch but we just let other people to watch instead, to give a chance than to act for our selves only. But then, as I know, there are people who took a video of their concert and they are going to post it on YT (youtube) and even Ayame Étoile have one (as I know) so if you missed it, just watch the vid they took for everyone to see their performance! Thank You for understanding and I hope you keep on supporting us. I noticed this two days ago. I was buying some tiger food when I noticed that I bought too much of tiger foods. Usually, it is C$500 for 10 pcs of tiger food but last time... it wasn't C$500 for 10pcs! It is C$500 for 100 pcs! LOL! Isn't that too much? When you buy 100 Tiger Foods, it cost C$ 5,000 already. So for the situation now, it's actually cheap than usual. That's why we bought so many tiger foods for our pets! Not yet voted? Well, there is still a chance to support us Étoile. Just continue voting, MaiRie Étoile or Jad Étoile in Ameba Pico of the Month of August. Jad Étoile and MaiRie Étoile are actually leading the votes! So don't miss out on supporting us with this poll! Thank You! 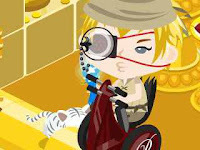 Get the TOP Celebrity Sidecar Motorcycle through spinning the latest Casino Gacha, Celebrity Rider Gacha by collecting the required items. Ameba Pico has a new park! 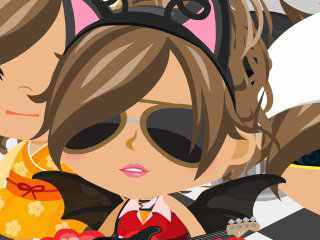 Most of us have been familiar with Ameba Word Chef or the restaurant version of Ameba Pico where you can learn how to cook different foods from different countries, build your won restaurant and earn money! 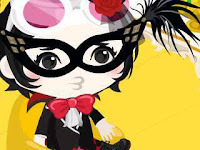 "You can be your own chef in World Chef and use your Pico to make food from around the world. you can design and customize your cafe to your liking with styles from around the world! 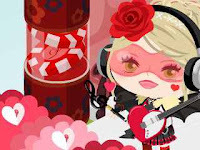 To celebrate World Chef, we are opening a new park in Ameba Pico, the World Chef Park! Come try out the special clothes and items we have created!!" Also, don't miss the world chef items that you can buy through gummies! 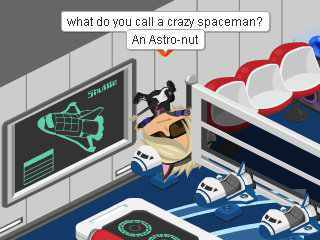 I went at Star Band Room and check out the actions that we are using for our next video and then, this made me surprised. "In a few seconds, I will change my name to something new. I don't want anymore fame. I don't wanna be high profile anymore. But I will still repeat what I really like to say. I will still love you people to the f***ing core. It's nice knowing awesome people like you. Goodbye. ♥"
I've already talked to Zye a.k.a Sєxqυιѕιтє about him,leaving our family, Étoile. It is actually for good, to start something new, not as an Étoile, not as Sєxqυιѕιтє but to a different person but still himself. I told him that he doesn't really have to do it but he said, he have already decided. Well, I say my opinions to people but it doesn't mean I'm teaching him/her what to do. So, I respected his decision and I know that, this is what he wants since before and finally, he made it up. Like wise, it's really sad to hear when someone is leaving. But, they are not really leaving like forever gone but it's for their own good. I know that this is still not the last time to be with Sєxqυιѕιтє but still we could be with him. you know how I felt when you asked me to join. 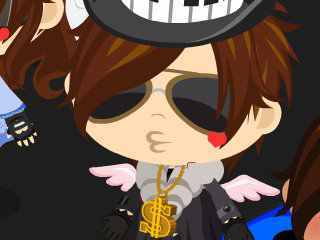 WESTERN PARK IN AMEBA PICO WORLD!!! Wow, we never expected that there will be a place about cowboys. I really love the new items now! It is actually one of my favorite gacha and I REALLY love the red dress and the NEWEST action,the Cancan Dance! Here's the Items you can get from Gacha! 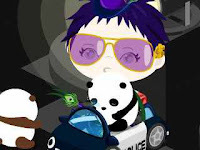 So you better check out this gacha and get these lovely items! I am sure you'll love it! Have a grate Cowboy life! Yah, I know... it sounds so good... so good to imagine that you got a special hidden rooms in your place but, is it safe? Well, I will answer it for you and I think most of you knows the answer. It is actually illegal.Remember that when you bought a room, you can't delete the room anymore and you'll have it forever. So,if ever you tried this.... I'm telling you that it is NOT safe. I know that everyone knows that and I'm just reminding you the possibility when you over do something.. So you know what will happen when you get caught. "In the last few days, my brother White suddenly can't access his Facebook account. We tried resetting his password and such but the results were still the same. The account cannot be accessed. We thought it was just a Facebook glitch and it will soon pass. But we were wrong. A few hours later, we discovered that his Facebook account had been terminated. Apparently, some LOOSER reported to FB that White’s account was FAKE and FB actually believed it. (-_-;)…. バカFB (you don’t need to read that). As a result, he can no longer access his AMEBA PICOaccount too. I tried convincing him to create a new one. But all efforts were in vain. He no longer wants to have a new Pico account. I even tried threatening but he said his answer was still no. (TAT) huuu…. It is really too bad. The contest is still open for those people who want to join. The owners of the TOP 10 FANSIGN Pictures will still included in the next video. The LIVE CONCERT on August 30 wil stilll proceed as planned. But only Yama-nii and Iwould be there. I will be making an event for this later on. You can check there for further details. And if you’re wondering who will replace White, well here is good news for you! We shall be conducting a CONTEST for the BEST PRB VOCALIST REPLACEMENT this coming September. So if you aspire to be our vocalist, you better prepare to be one! Lastly, I hope the dude that reported White D***!!!! 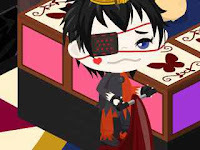 Even if White no longer opens his Pico account, you could still go visit his room! (>w"
This is actually the main reason right now whyour dad, White! Étoile can't online through his account. These past few days, he's using our mom's account, Yellow! 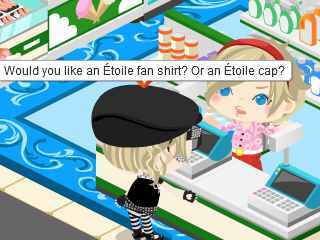 Étoile just to see his Ameba Pico friends and to bond with us. Still, right now, I can't accept what happened to our dad's facebook account. His pico is fine but he can't online because of his facebook which were reported by someone that it is fake. Right now, I'm not feeling I like facebook anymore, what they did is actually too much and I can say, it was careless. Thank You for our participants! We receive about 260+ photo entries within two weeks and it's actually more than our previous events. It was hard to choose the photos specially with the candidated photos. Now, we are announcing the winners, judged by White! Étoile. Congratulations To the winners! Winners will be receiving their prizes soon. We are hoping for our readers, supporters and friends to continue on supporting us with our events. Thank You very much! Are you familiar with Pico of the Month? It has a page on facebook and they have a monthly voting for their Pico of the Month. Last time, White! 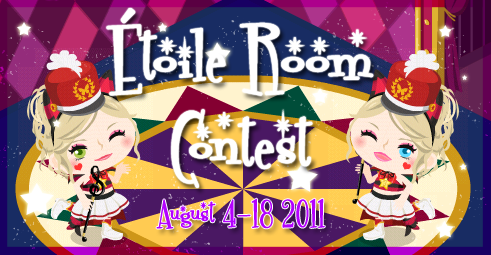 Étoile was a candidate for July's Pico of the month, the first voting for their Pico for july. Now, for this month, Jad and I were chosen to be a candidate for Pico of the month for the month of August. It's easy to vote for their poll! Just visit this link, [August]Pico of the Month and vote for the pico who you wanted to win. You don't have to like the page, just visit the link! Have you heard the final theme for the Last day of photo contest? It's Confess of LOVE! Take a picture of you with a confession of unforgiving love just like the mermaid story! How would you confess your love to the human you love? Click here to see more information and on how to join!